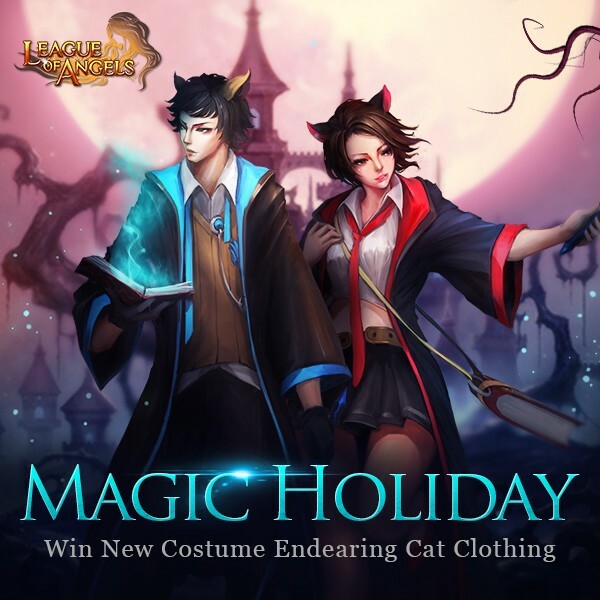 LoA_Magic Holiday​:Welcome to the Magical World! Magic Holiday is about to begin in the angels' land. It is said that legendary endearing cat wizard suit will finally appear in the world, warriors all over the mainland heard this news and are coming towards this place to seek for this unprecedented Costume! What are you waiting for? Come on and get magic treasure! Click the icon of Magic Holiday you will see four parts. They are Magic Spirit, World Boss, Magic Chest, and Magic Shop. Fight together and get great rewards here! Click Magic Spirit you will see this panel. 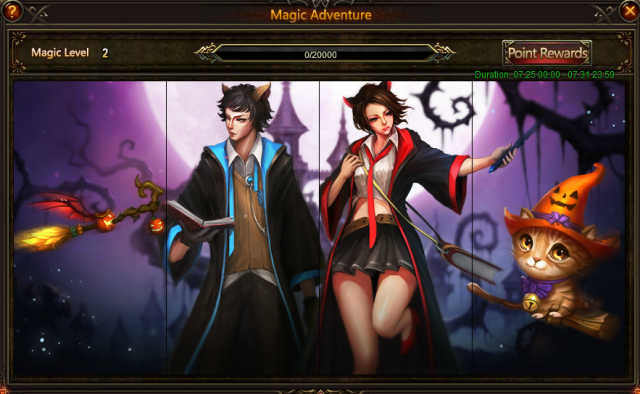 When Magic Spirit EXP reach certain amount, all players in this server can collect the rewards. 1. 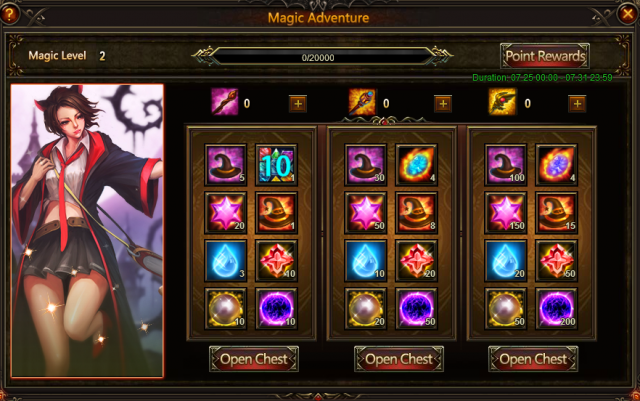 Magic Holiday consists of 4 parts: Magic Spirit, World Boss, Magic Chest, and Magic Shop. 2. Every Magical Hat acquired will earn a player 1 personal point and increase the Magic Spirit's EXP by 1. Every Mystical Hat acquired will earn a player 2 personal points and increase the Magic Spirit's EXP by 2. 3. All Magic Spirit level rewards can be collected once daily when available. 4. Join the World Boss during the event for a chance to receive Magical Hat. 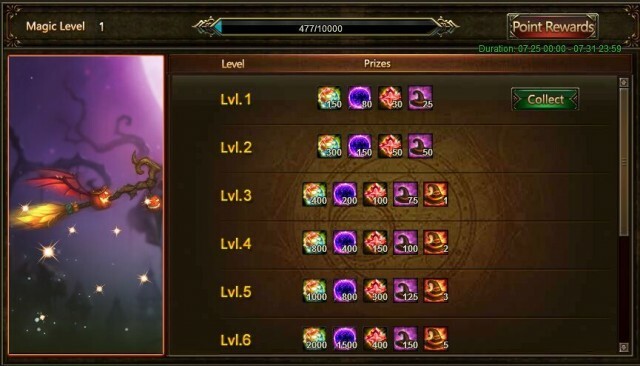 The top 50 in World Boss ranking have a chance to receive Mystical Hat and Magical Hat! Can you and partners in your server reach the top level during the 7-day party? Come and try! Resources, Magical Hat, Mystical Hat, Vitamin are waiting for you in Gift Boxes! You can randomly get one of the following items with different kind of magic wands. There are 3 kinds of gift boxes. You need to collect magic wands to open them. 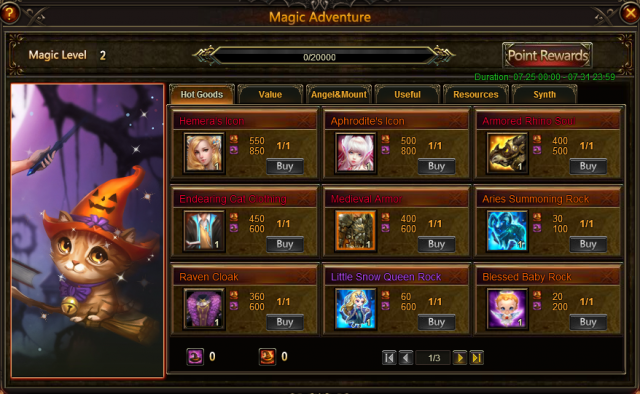 You can get Normal magic wand, Advanced magic wand, Superior magic wand through hot events or use diamonds to buy. You may ask, how to deal with the Hats I have got? Ok, here comes a chance for you to exchange items with Hats! Broom, angel Hemera, Aphrodite, Elena, Fairy Blessed Baby, Little Snow Queen, and many more other items! Description: Complete daily challenges to collect Mystical Hat! Description: Complete daily challenges to collect Magical Hat! Description: Collect enough magic wand to open more chests! Description: Singel recharge certain amount to get excellent items! Description: Total recharge certain amount to get excellent items! Description: Exchange Feather for Element Scroll. Description: Recharge certain amount of diamonds to get items for Magic Holiday! Description: Log in everyday to collect Normal Magic Wand and Nectar! More exciting events are coming up through Jul 25 to Jul 31 (server time), check them out in the in-game Hot Events menu! LoA_Cross-Server Resource Tycoon: Compete for Pegasus! LoA_Angel Exclusive: Let's fight with her! LoA_Get rewards in Angel Quiz! LoA_Enter House of Cards, Find the Best Teammates Ever!